Yesterday I was thinking I should stop going to my usual spots in Chinatown and try a new place. I ended up at New Hon Wong, which is convenient because it’s right by the N/Q/R station on Canal. 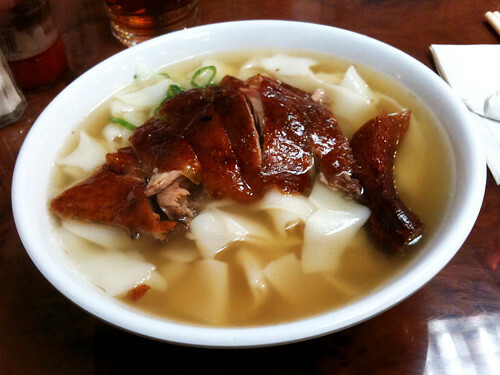 Roast Duck Noodle Soup ($5.50) with ho fun was decent. The duck was okay (it could have been meatier), but the noodles were too broken up, and there were no vegetables save for some sliced scallions. I was in and out of New Hon Fong in less than thirty minutes though, so if you’re in a rush, it’ll do. @someguy – Of course you do!